Can I mark up homework? How to highlight, mark up, and annotate LSAT homework. 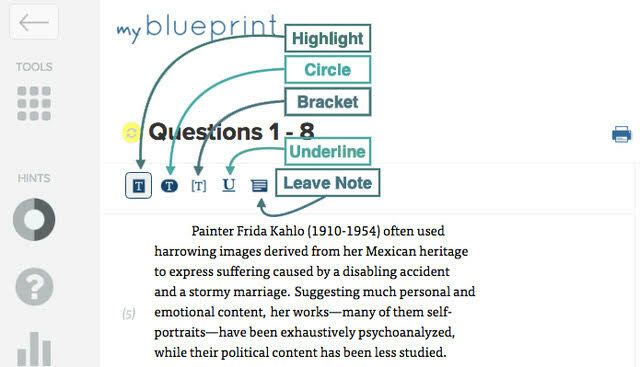 You can use your cursor to highlight text in the stimuli for logical reasoning questions, logic games prompts, and reading comprehension passages in your MyBlueprint online student account. Just click and drag your cursor along the text you want to highlight! To remove highlighting, click the yellow circle next to the question number. Additional markup tools are available for reading comprehension passages. You can highlight, circle, bracket or underline selected text, or leave a margin note! To mark up a passage, click the icon of the tool you wish to use, then use your cursor to highlight the text to apply it. To remove a markup, re-highlight the already marked text. To leave a margin note, choose the Note icon, then select an area of text within the passage to connect the note to that specific section. Note: Highlighting will only be visible the first time you work through a question and will not be available in review mode. After a question stimulus or reading comprehension passage has been completed, the instructor markup for that stimulus or passage will be shown in review mode.